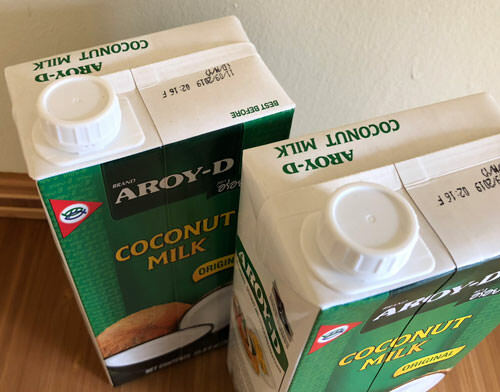 Aroy-d has just released a new easy-open (and close) top for their all natural coconut milk in large boxes. All natural coconut milk and cream is one of our top selling products, see complete description and other sizes here. Pure, all-natural coconut milk can only be made using the very best quality coconut; everything else usually goes into cans with preservatives. The all-natural cream we offer is packed in a modern paper carton (BPA free, made by SGI Combibloc of Switzerland or Tetrapak of Sweden). Coconut fat is considered a healthy, good fat and we recommend using higher fat milks for best results. There is no difference between 'milk' and 'cream', only the fat content -- the two look identical. We also offer Aroy-d all natural coconut cream.